The last post began with a spooky Halloween post from the East. So here’s one from the West. I didn’t find any ghosts inside, but the Western cultural currents I explored were more interesting than anyone’s dark dreams. The castle actually received light from Italy. Italians in the 15th century, and the early 16th, added new ways to express the focus on abstract lines and shapes which the West has held since ancient Greece. Great art from Florence, Venice and Rome spread north as people traded with each other. 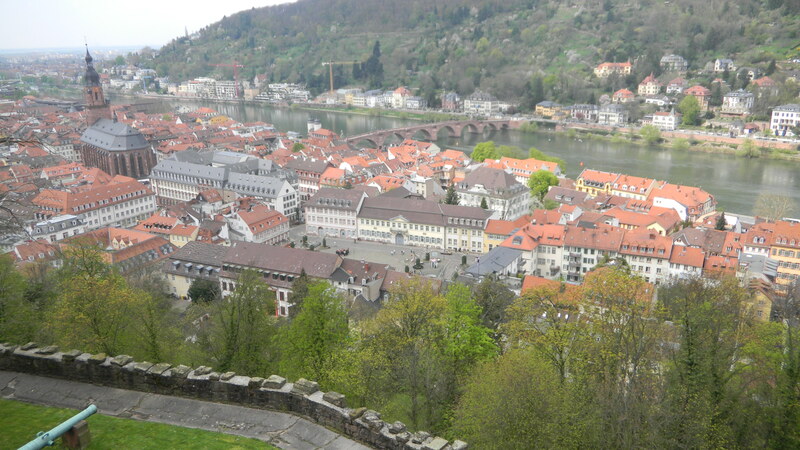 Heidelberg straddles the Neckar River, which flows into the Rhine, so it was an important hub along trading routes. 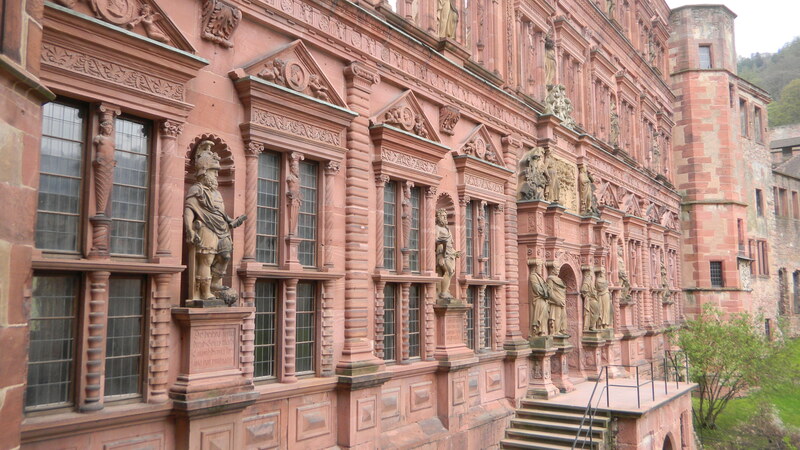 So when the Flemish sculptor Alexander Colin (1526-1612) carved a classical-style facade for the Elector Ottheinrich, its forms inspired many artists in Germany who grew up in their land’s great Gothic and Romanesque traditions. Even though the Ottheinrich Building’s (above) deserted, it doesn’t look too spooky. 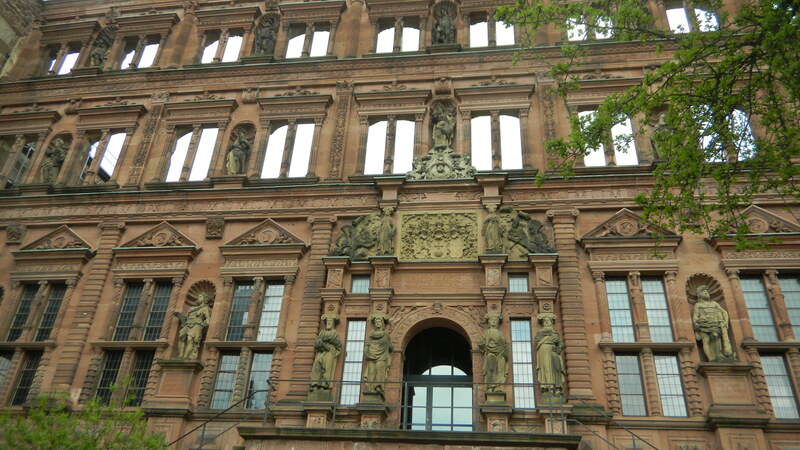 Its well-proportioned lines and stately sculptures were even more magnificent when it was new. 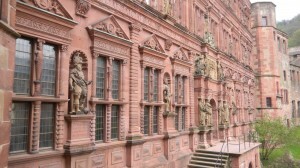 It had an audience chamber and a large banquet hall where the Elector could impress many guests. And he wanted to impress them with his good government as well as his refined tastes. Greek gods and figures from the Old Testament embodied all the good things that he wanted his colleagues to identify him with. 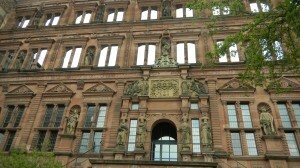 16 allegorical statues were placed in a line on the 4 original floors. Each presided in a niche between a set of double windows. 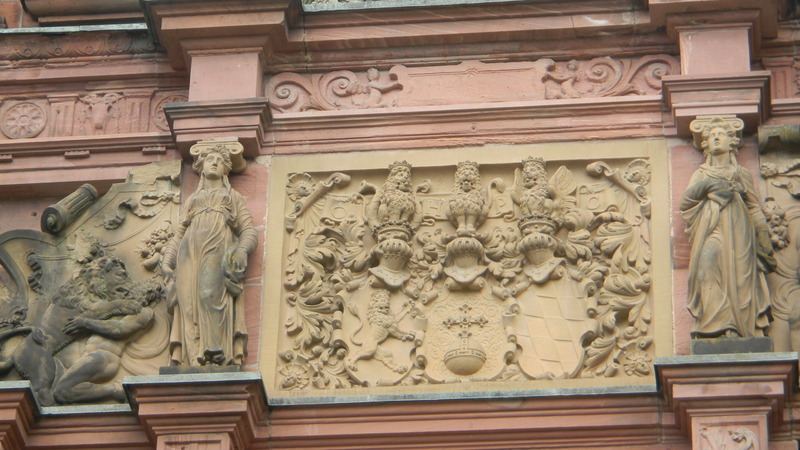 The niche’s form seems transported from buildings in Florence, like Orsanmichele. The ground floor held symbols of military might: Joshua, Samson, Hercules and David. Christian virtues were personified on the 2nd floor: Faith, Hope and Love. So were 2 virtues from ancient Greece, Fortitude and Justice. A good ruler should fuse the values from both times. And he should be in harmony with the universe, so the top 2 floors’ statues stood for Saturn, Mars, Venus, Mercury, the moon, the sun and Jupiter. Uranus, Neptune and Pluto hadn’t been discovered yet, so the Elector was aligning himself with the complete solar system. 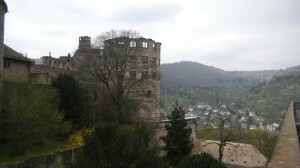 Above, you can see the view from Heidelberg Castle. The Elector arranged these hoary figures from classical mythology and the Old Testament in well-proportioned lines to project an image of a well-run universe. 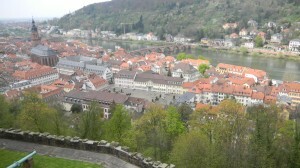 And the castle hovering over Heidelberg was a very powerful image–the Elector impressed. And he impressed folks with the ancient Western love of line and abstract shapes, rather than Thai forms, as the source of order. But as he reinforced them as key sources of meaning in Western culture, he made them even more robust by blending Gothic style with them. 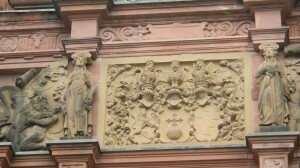 The coat-of-arms tablet in the above shot rests over the entrance, and its late Gothic forms add life to the facade and prevent from it being excessively symmetrical and formal. The Elector adopted forms from the ancient West, but by mixing German traditions with them and spreading them in northern Europe, he made them even richer. This process happened in Augsburg too. So the more you examine the West’s focus on lines and proportioned shapes as nature’s and culture’s most basic forms, the richer it becomes. They seem basic, but like Thai temples, they take on infinite variations. Basic assumptions reflect a cultural landscape with infinite dimensions, which has roots in the ancient past. What seems basic reflects a whole world.